Our construction team sent a few more photos showing the work progress on our new home – at this stage of the project, the shapes of the new spaces at 1115 Queen West are starting to come through. 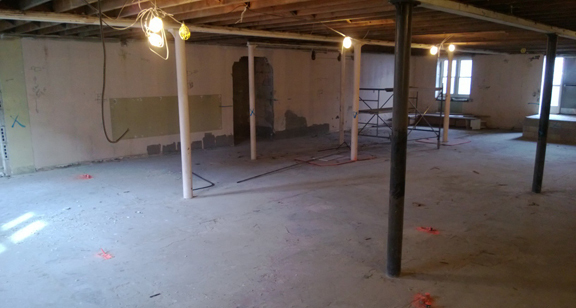 A snapshot of the future main performance space on the upper floor: imagine a flexible 200-seat black box theatre here! The lovely coffered ceiling details will stay. 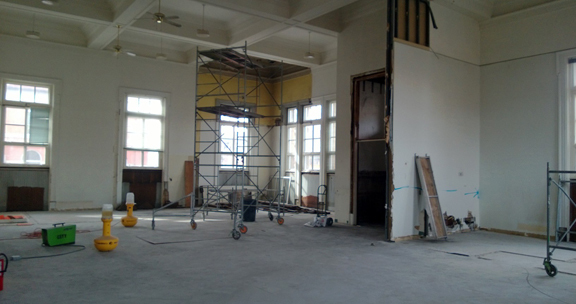 Here is the panoramic view of the main space, showing the scope of the demolition work already performed, and some of the things that are still to be done! We can’t wait to share more progress news with you soon. ← Older: New Home: What’s Happening? On Friday March 15th, we are kicking off our CIVIL DEBATES series with a debate around Creative Cities ideologies.